AND THE WINNER OF MY GIVEAWAY IS…. (Please send me an email at sallybr2008 at gmail dot com, so I can get your address and ship the book to you next week). Thank you so much for all who commented, I was particularly touched by the first time “commenters” who said hello, it was amazing to realize that some people have been following my blog for several years, but stay in the background, so I was totally unaware of their presence. Still, they all had wonderful things to say about the Bewitching Kitchen, giving me even more energy to go on sharing my recipes, stories, and eventual cake baking boo-boos. I enjoyed reading all the comments, even if I opened an exception and did not reply to them. As you may know by now, I make a serious effort to address each comment I get, maybe missing some that might pop up in old posts, often because I tell myself I’ll go back to them later, but… life interferes. Life actually interferes a lot with the best blogging plans. I still owe you a post about our trip to Hawaii last March. It will come, I promise. 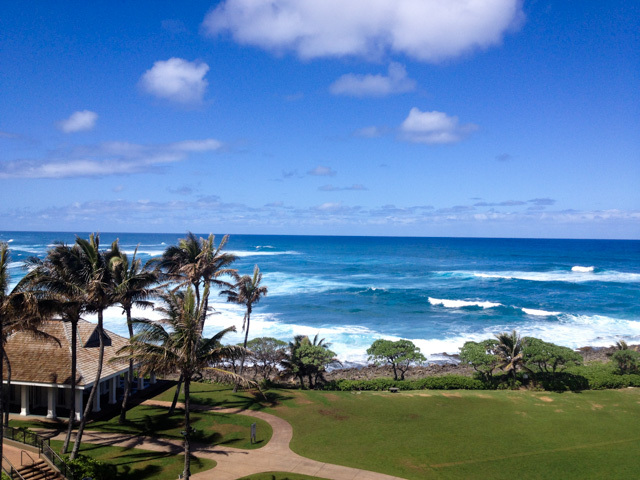 In the mean time, I leave you with a nice photo from that trip, the view from our hotel room at Turtle Bay. I think I need a little vacation soon! Thanks again to all my readers, I still cannot quite believe I made it to six years! Unreal…. Congratulations Anne. I would love to hear about some of the recipes from the book. A wonderful surprise! A big thanks to Sally and the Bewitching Kitchen for the chance to discover the magic of Portuguese food. Figures, the one post of yours I miss, you are giving something away! Happy Belated Blogversary!